This is a book that has been long in coming! I first started out creating this book in 1992. It was after reading an MVPA’s Army Motors article by Bryce Sunderlin concerning the availability of the wartime Army Motors magazine. When I obtained copies, it was only available in microfilm form. I wanted a copy that I could hold in my hands. 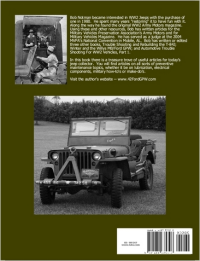 Well with 1200 pages or more to choose from it would have been an exceedingly difficult task–so I concentrated on the World War Two jeep and articles that might be used to support it. My first attempt was very bad. The technology of the day was analog and either black or white, no tonal qualities. Flash fordward about ten years and then the technology was digital. So I had the microfilm converted to digital form on CDs. Next I edited each page, sometimes spending up to three hours cleaning up the stray marks on the page. I ended up with a projected that was approximately 440 megabytes. I couldn’t find a publisher that would take on the project. Even the print on demand outfit I normally use couldn’t handle the size. Finally, I found a publishing out fit that could handle the size. I hope you enjoy it. 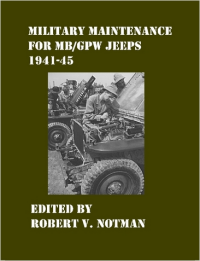 For your reading pleasure, a few teaser pages extracted from my book Military Maintenance for MB/GPW Jeeps 1941-45. This includes a few pages from the introduction and a couple of other interesting pages plus the covers. Please note the kb which hopefully will give you a warning as to how long it might take you to download some of the pages. cover 187kb i 145kb ii 63kb iii 46kb 1 60kb 2 157kb 3 194kb 4 66kb 5 65kb 25732kb (note this page is not linked to the others) 179 655kb 275 1034kb rear 645kb index 61kb To help you decide if this book is for you I have posted to the web the books index. As you can see there is a lot of information in this book. If you would like a copy of my book in print, the price is $34.95 plus shipping (the vendor will ship anywhere in the world!) via www.lulu.com/42fordgpw.